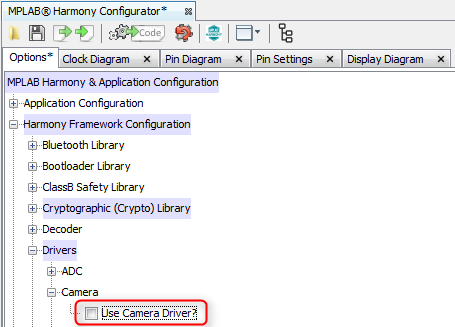 In MHC's Options tab, expand the Harmony Framework Configuration > Drivers > Camera selection tree. Check the "Use Camera Driver?" box. 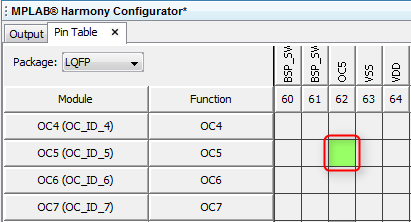 In MHC's Options tab, expand the Harmony Framework Configuration > Drivers > OC selection tree. Check the "Use OC Driver?" box. 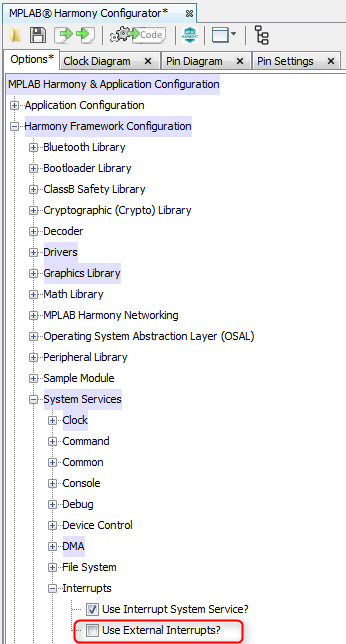 Configure the OC driver as shown in the below graphic. 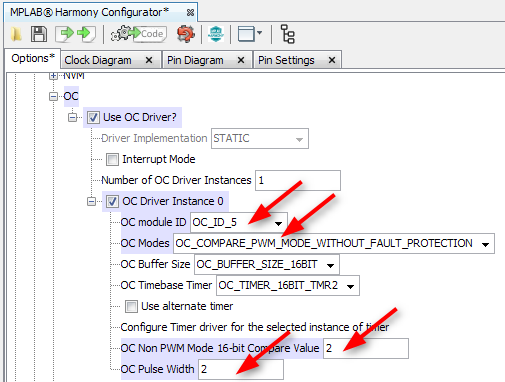 Configure OC5 in the pin manager as shown in the following graphic. The Camera module is connected to one of the PIC32's I2C ports (I2C3). Configure the I2C driver used by the Camera module. 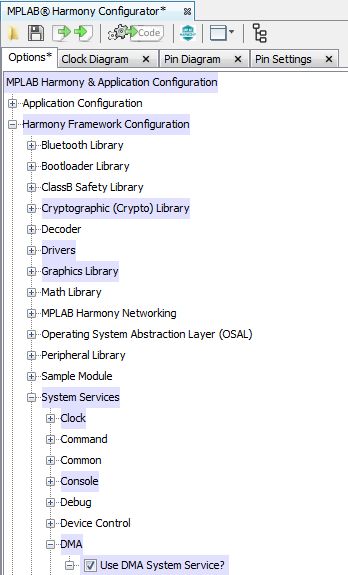 In MHC's Options tab, expand the Harmony Framework Configuration > Drivers > I2C selection tree. Note when you checked the box beside the "Use Camera Driver?" 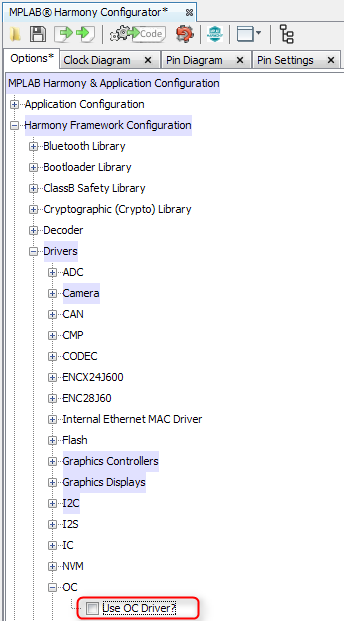 selection, MHC automatically checked the "Use I2C Driver?" box for you. Configure the I2C driver as shown in the following graphic. Verify and Configure the I/O Pins used by I2C module using the Graphical Pin Manager. 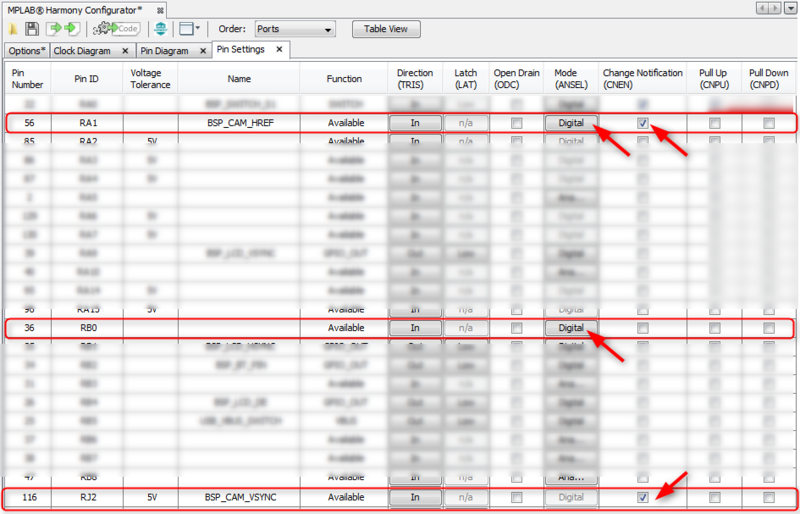 Select the Pin Table tab in the MHC output pane and configure the I2C pins as shown in the following graphic. 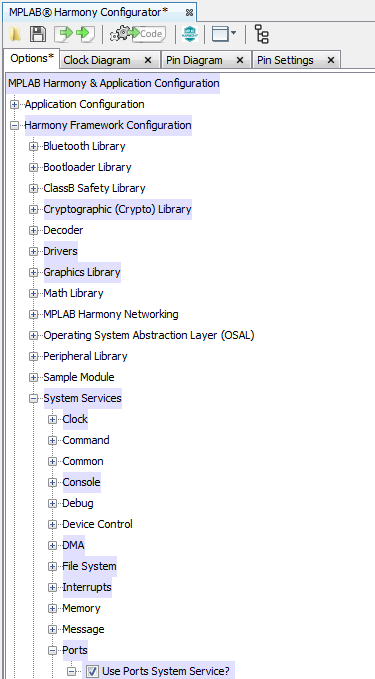 Expand the following section to see descriptions of all I2C driver configuration options. For the functioning of the Camera, Change Notifications have to be enabled for the HREF and VSYNC pins. Also make sure that the pins connected to the camera are configured as digital pins. The BSP for pic32mz_ef_sk_meb2 will assign the some of the pins for accessing the on-board SRAM device. SRAM will be used by the LCC driver, if you configure it to use external memory. In this demo, you will configure the LCC driver to use internal memory. The pins which are mapped to SRAM, are shared with the data lines of the camera module. So you need to modify the pin mapping to use these pins for the camera module. If these are not properly mapped, then the camera module will not work properly. Follow the diagram below to map the pins to the camera module. A timer is required for the functioning of the camera module. Since you already have used the Timer Driver Instance 0 for Timer system service. You will be using Timer driver Instance 1 for the camera module. For Timer driver instance 1 you are using Timer module ID 2. Configure the "prescale" value of the timer to TMR_PRESCALE_VALUE_1. 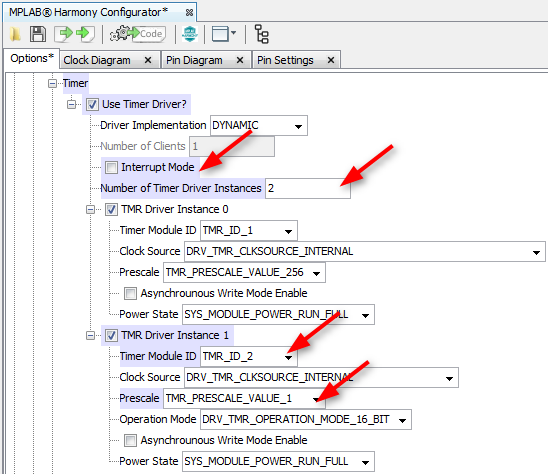 In MHC's Options tab, expand the Harmony Framework Configuration > Drivers > Timer selection tree. Configure the Timer driver as shown in the following graphic. The camera module uses external interrupt INT2 as its peripheral clock. So you need to enable the External Interrupt system service and do the pin mapping for the same in the pin manager. 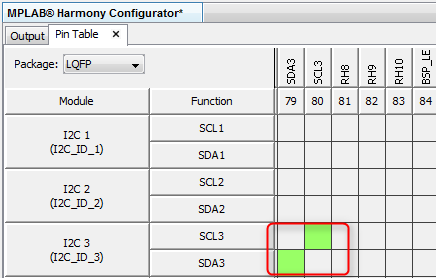 In MHC's Options tab, expand the Harmony Framework Configuration > System Services > Interrupts selection tree. Enable the "Use External Interrupts?" checkbox. Configure the INT2 to the External Interrupt Instance 0 as shown in the below graphic. Assign the pin for the INT2 in the pin manager as shown in the below graphic. You need to increase the priorities for the DMA and Change Notifications. In MHC's Options tab, expand the Harmony Framework Configuration > System Services > DMA selection tree. Increase the interrupt priority of the DMA system service as shown in the below graphic. In MHC's Options tab, expand the Harmony Framework Configuration > System Services > Ports selection tree. 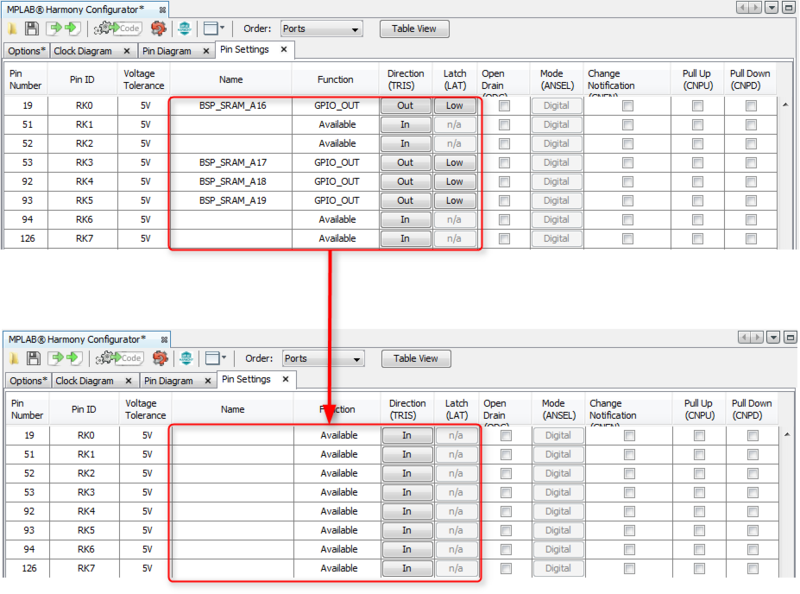 Increase the interrupt priority of the Ports system service as shown in the below graphic.